To facilitate its users find the applications that are compatible with the device, reportedly Sony Ericsson recently has made strides with the release of the latest breakthroughs Android Market Channel service for the first time. Portal tract itself is equipped with a host of features intended to provide specific to the users of Sony Ericsson Android with a more enhanced experience, including the recommendation that one of them is the option to discover the original applications that come from Sony Ericsson or to access other exclusive games. The existence of the new features available on this service is only for a few customers Sony Ericsson, because the availability will depend on the wireless operator they use. "Today we have launched its own channel we at the Android Market," said Rikard Skogberg in his last post on the official blog of Sony Ericsson recently. "We are the manufacturer's first mobile phone capable of doing this and I am very excited to see what will we be able to get later. These channels will soon be available for most of you out there from now on. These channels contain features that depend on the existing operators. Although these channels do not cater for all users of Sony Ericsson, but certainly most of you will get it (especially for users of Sony Ericsson Android) ". Basically, this new feature will be present on the user device as a link that will replace the option "My Apps" in the Android Market. Sony Ericsson's consumers will benefit from a direct link to a specific channel in the portal application. And "My Apps" will still be available to them via the menu button presses. * Provide a variety of recommendations to help you find the best games & applications that enhance the use of Sony Ericsson devices you have. 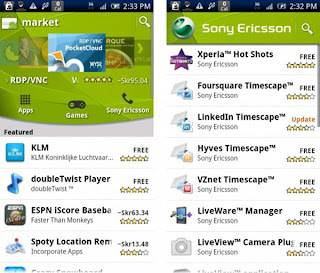 * Provides an easier way to find the original application from Sony Ericsson, such as Timescape plugins, etc. * From time to time offer exclusive games & applications that are only available in this channel alone. * Helping Our developer partners in promoting the application of game they make & give their own market space to our consumers. According to Sony Ericsson, this new channel may be more intended to offer to its users to find applications and compelling content for their devices in a way that is easier than ever. It will also increase the usage on their devices, of course.